This Saturday 27th September is the Bristol & Avon Family History Open Day. It's on from 10am to 4pm at The University of the West of England in Bristol. Entry is £2 per person and young people under 16 have free entry. There's a number of excellent talks happening throughout the day including the popular 'Breaking down brick walls' with Mark Bayley from TheGenealogist, Jacqueline Wadsworth 'The Effects of World War 1 on home life' and Clive Burton 'Bristol at the outbreak of World War 1 and the formation of Bristol's Own'. If you have ancestors in the Somerset, Gloucestershire or Avon areas, or live nearby, why not visit the Bristol & Avon Family History Open Day? There's more details at the Bristol Family History Society website. If you've got an old selection of slides and negatives that have been passed down through the generations, it's often a hassle having to get out those bulky slide projectors or back-lit panels. However, with the Slide, Negative & Film Scanner you can view these old gems quickly and easily. Simply connect via a USB cable to transfer images to your computer. These stand alone scanners store your pictures on a memory card which can then be transferred to your computer by a USB lead. There's also some good offers to be had at the moment too. S&N Genealogy Supplies have a special offer this weekend on the 'Slide, Negative and Film Scanner Premium Bundle'. You can save over £245 with this current special offer. The Premium Bundle contains everything you need to digitise your slides, negatives and films. Visit their 'Offer of the Week' page to find out more. The National Archives this week announced the release of more than 3,300 Security Service records available online to view. Within these new records is a fascinating file on the use of an 'agent provocatrice' by The Special Operations Executive (SOE) in Second World War Operations. The SOE used this 'agent provocatrice', known as 'Fifi' but real name Marie Christine Chilver, as part of the training programme for SOE students before they were sent out into enemy territory. Students would use the skills they learned at SOE's security training school at Beaulieu to carry out secret training activities all over Britain. The trainers would lay traps, either police interrogations or the temptation to part with secret information to a pretty young lady. Fifi played her part in these training schemes and managed to trip up many of the SOE trainees. The release of this file (HS 9/307/3) reveals Fifi's identity and her special talent for character assessment which enabled her to extract information from up and coming trainee secret agents. The file contains Fifi's reports on trainee agents and handwritten correspondence from her relating to SOE training operations. There's more details on the new records and the role of Fifi and the Special Operations Executive in The National Archives blog. The latest episode of Who Do You Think You Are? continues tonight on BBC1 at 9pm with Martin Shaw, star of The Professionals, Judge John Deed and Inspector George Gently. Martin’s family roots have strong Birmingham connections in the thriving brass industry of the 1800s. If you’d like to know more, TheGenealogist has looked into his family history in their 'Featured Article' section. It promises to be an interesting episode tonight. There's a grandfather who suddenly disappears and also some of Martin's ancestors were involved in the gun manufacturing industry in the 1800s, a coincidence given the 'expert shot' that Martin Shaw played in his acting role in The Professionals, that of former Detective Constable Raymond Doyle! What are your thoughts on the series so far? For those family historians looking for a bargain this weekend, S&N Genealogy Supplies have another special offer running. Buy any three directories, Army or Navy Lists and the cheapest one is free. If you'd like more information visit their special offers page to find out more. Sheridan Smith on Who Do You Think You Are? The latest programme in the Who Do You Think You Are? series continued last night with acclaimed Lincolnshire actress Sheridan Smith and her family history story. The programme continued the style of many previous shows this series by mainly concentrating on just one ancestor. Benjamin Doubleday, Sheridan's great great grandfather, was discovered to be a popular and respected banjo player who worked hard to make a name for himself in show business in the Sheffield area. However, in a competitive industry he over-committed himself and ended up bankrupt, losing his family and trying to allegedly commit insurance fraud. The story had many interesting twists and turns and Benjamin manages to reconcile with two of his daughters (also musicians) and returns to show business in the years before his death. TheGenealogist has looked into Sheridan's family history and discovered some other unique records, including details of his bankruptcy in the 1890s. If you'd like to know more, TheGenealogist has uncovered more which can be found here in their featured article. What did you think of last night's episode? If you'd like to keep updated on the latest family history developments and special offers, it's worth taking a look at the latest email newsletter from S&N Genealogy Supplies. With details on the latest record releases from TheGenealogist.co.uk including over 1.3 million records of wounded soldiers from the First World War and a new collection of Distinguished Conduct Medals now online and the latest downloads from Surrey parishes available from S&N, there is something for every family historian. 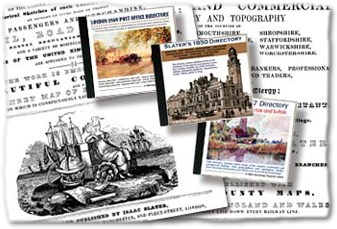 There is also a special offer on binders and sleeves if you're looking to get all your valuable documents in order and a competition to enter to win some great prizes in this free e-newsletter. It's all available at S&N Genealogy Supplies Email News.